A Time to Change pledge to raise awareness of mental health has been signed by an NHS Trust in Harrogate, as part of World Mental Health Day 2018. The Time to Change pledge is a commitment to raising awareness around mental health and ensuring a package of support is available for all employees to help maintain positive health and wellbeing. Harrogate Healthcare Facilities Management, a wholly owned subsidiary company of Harrogate and District NHS Foundation Trust, has also signed a pledge. The movement works to change the way people think and act about mental health problems. Statistically, 1 in 4 people will fight a mental health problem in any given year. Trust Chairman, Angela Schofield, and Harrogate Healthcare Facilities Management Managing Director, Phil Sturdy, signed the pledge at a Time to Change event at Harrogate District Hospital, joined by colleagues from both organisations. Angela said: “In signing the Time to Change pledge, the Trust is committing to support the mental wellbeing of all of our colleagues; to remove the stigma around mental health and to care for those who have mental health problems. 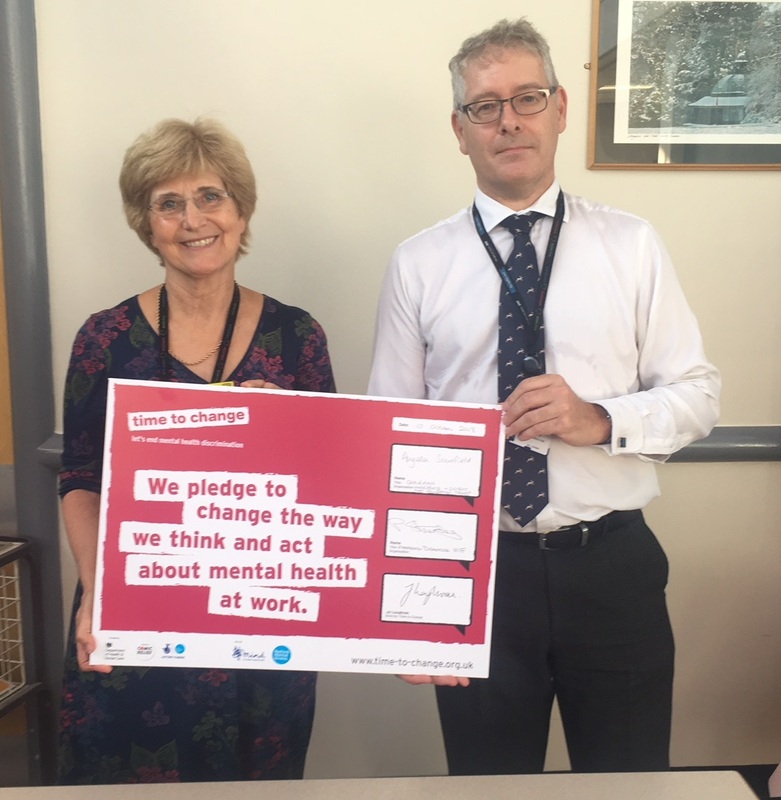 Pictured: Angela Schofield, Chairman of Harrogate and District NHS Foundation Trust (left) and Phil Sturdy, Managing Director of Harrogate Healthcare Facilities Management (right), after signing a Time to Change pledge. Notes to editors: Harrogate Healthcare Facilities Management is a wholly-owned subsidiary company of Harrogate and District NHS Foundation Trust.